AMERICAN ART AWARDS - "Honoring the Creative Force in Art." ART PRIZE - since 2009. An international art competition held in Grand Rapids, Michigan, U.S.A. ArtPrize is unusual both for the large size of the top prize (US$200,000, combined with other prizes cumulatively amounting to $560,000), as well as for the method of judging entries. Unlike traditionally juried competitions, ArtPrize contestants are juried by the public. Artists and venues (exhibition locations) negotiate and coordinate during a process called Connections. During the event, installations are voted upon by the public using modern networking technology. BUCKSBAUM AWARD - established in 2000 by the Bucksbaum Family Foundation and the Whitney Museum of American Art. It is awarded biannually "to honor an artist, living and working in the United States, whose work demonstrates a singular combination of talent and imagination." The $100,000 prize is the world's largest award given to an individual visual artist. CARNEGIE ART AWARD - to promote Nordic contemporary painting. Future Generation Art Prize - established by the Victor Pinchuk Foundation in 2009 is a worldwide contemporary art prize to discover, recognize and give long-term support to a future generation of artists. GUGGENHEIM ART AWARDS - since 2009. The First Annual Art Awards. MARCEL DUCHAMP PRIZE - annual award given to a young artist. The winner receives 35,000 personally and up to 30,000 in order to produce an exhibition of their work in the Modern Art museum (Centre Georges Pompidou). MaxMara Art Prize for Women in collaboration with the Whitechapel - biannual Art Prize for British-based female artists organized by the MaxMara fashion house and The Whitechapel Gallery in London. The Prize includes a 6 month residency in Italy to realize an Art project which may be exhibited at The Whitechapel Gallery in London and it will be acquired by the Collezione Maramotti (Italy). Praemium Imperiale - since 1989. (Lit. "World Culture Prize in Memory of His Imperial Highness Prince Takamatsu", is an arts prize awarded since 1989 by the imperial family of Japan on behalf of the Japan Art Association in the fields painting, sculpture, architecture, music, and theatre/film. These are areas of achievement not covered by the Nobel Prizes. Roswitha Haftmann Prize - since 2001. Prizewinners are selected solely on the basis of the artistic significance of their work, without regard to their personal circumstances (nationality, age, gender, etc.). The Prize worth CHF 150,000 (US$157,000) is awarded in Zurich, as far as possible during a public event in the Kunsthaus. THE HUGO BOSS PRIZE - awarded every other year to an artist (or group of artists) working in any medium, anywhere in the world. The prize is administered by the Guggenheim Museum and sponsored by the Hugo Boss clothing company. THE LARRY ALDRICH AWARD - the biennial Larry Aldrich Award honors an American artist whose work has had a significant impact on contemporary visual culture during recent years. 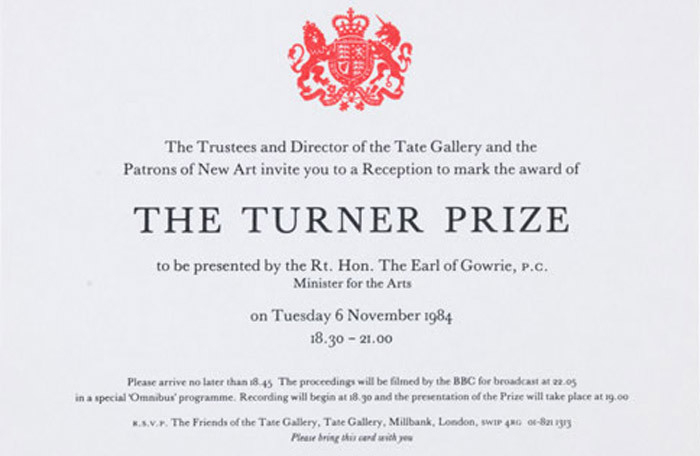 TURNER PRIZE - contemporary art award that was set up in 1984 to celebrate new developments in contemporary art. Presented to a British visual artist under the age of 50.